“We give something to the crowd and they give us something back,” says Bono. “Everyone pushes themselves until they sweat – and through that, a type of force or power is created by the people." North Side Story is the definitive account of the emergence of U2 in Dublin in the 1970's and early '80's. Along with a unique catalogue of interviews and reviews from Hot Press magazine, the book features a series of profiles from influential European music titles - including this one from Germany's Music Express in 1982. 'As the plane drifts towards Ireland, green meadows can be seen through the window. Farmland stretches to the horizon: rectangular fields, dark patterns marked by the plough. Has it ever been different here? A voice sounds through the speaker: any passengers, who came in contact with farm animals over the past week, please register with the Department of Health after landing. The honest farmers form a queue, as Airport Security checks our luggage, filled with the cameras, tape-recorders and other equipment needed for our work. I feel like a visitor from outer space. And when Dublin tries to meet the so-called demands of our so-called lifestyle, something doesn’t quite fit. We pitch our tents at the Stillorgan Park Hotel, an unimpressive cluster of imitation Art-Deco bars and discos. Tears form in our eyes at the sight of this imposing debris, in what is a barren residential area. In the bar, the Coconut Grove, waitresses clad in tiger-print numbers bring cocktails to our table, which is situated between two Palm Trees. And although the drinks have exotic and decadent names – “Miss, can I have a multi-storey Coconut on ice?” – their efforts to impress us are in vain. The highlight of the afternoon comes when Alan Bangs spots a giant canister of rat poison in the restaurant. In town, however, things look a whole lot different. Dublin comes to the fore. There are travellers out on the street. The bookshops are overflowing with Irish literature and an avalanche of religious works. The range of rock’n’roll LPs in record stores is nothing when compared with the volume of trad records. Guinness on tap magically fills the pubs with life. The real Dublin seems self-sufficient, as if it has its own sense of time, different to that of its neighbour England, yet in no way inferior. A change of scenery. We find ourselves in the Main Hall of The RDS, where I meet a mass of Irish kids, who have come to pay respect to their hometown heroes. The band’s manager whispers something about ‘six and a half thousand’ in my ear. Although it doesn’t look like that many to me, the number is not important: I am intrigued instead by how unusually dressed the crowd is for a Rock ‘n’ Roll show. At first I’m not sure how or why: then I see it. Or rather, I see nothing. No colour, no fashion. Hair that is not particularly long, nor particularly short. And clothing? There’s almost nothing but Levi’s for the working masses and teeshirts all round, on men and women alike. Which is refreshing after seeing nothing but Phil Oakey fringes in The Rainbow when Human League played there in December. In this respect, the support acts – Jump Iceland and Some Kind of Wonderful – hardly distinguish themselves from the audience. They look as though they’ve come directly from working in a dockyard, a building-site or a bakery. Something similar could also be said about U2, had I not heard by chance how bassist Adam Clayton had ordered silk pyjamas from the band’s fashion advisor, Jenny something-or-other. I guess that U2 have somewhat cultivated their radical chic: however, I won’t judge them for that. It is showbiz after all; contact with a different world has clearly rubbed off on the band. However, as soon as The Edge, the creative guitarist of U2, plays the opening chord, the crowd is electrified, moving in rhythm just like football fans: a remarkably open-minded response to a remarkably dramatic entrance from the band. That is what the band’s singer Bono calls ‘a question of give and take’. I have a weakness for the same feeling. To try and change the gears of the cosmos, however awkwardly – that seems to me to be a job most suited to artists. The bottom line here is something more remarkable than the triviality of dishwashing or job centres, which a lot of the New Wave outfits seem to dwell on. Although U2 hardly approach religion with the same sensitivity as Van Morrison, let alone James Joyce or Yeats, the fact is that the attempt alone shows an awareness of their heritage, in a land where they have had to deal with conflicts over religion for centuries. To make their feelings of nationality clear to every last person, U2 unveil a bagpiper for ‘Tomorrow’. The instrument delivers an incredibly fluid, bellowing drone. It’s a shame that the group can’t use the instrument on all their songs. Beyond their handful of truly inspired songs, U2’s music is difficult to analyse. This is partly because they are not yet fully developed and partly because their direction, though apocalyptic, in the end appears – at least to this listener – to be somewhat flat and forced. In the beginning, in their enthusiasm, the band play overexcitedly. They exhibit a wildness, which can’t be surpassed later. This is an old problem in rock music. Someone once wrote that the most exciting moment at a concert by The Who is when they arrive on stage – from then on, it’s all downhill. I think the analogy is interesting, because U2 could be the next Who. They fill a vacuum in contemporary pop music. Hip music critics crave a scene led by the likes of The Lounge Lizards or Red Crayola, but that could never work in commercial terms. U2 hit all the right notes, delivering a reasonable illusion of unrestrained energy and absolute force – and the listener doesn’t need to read the well known music magazines to understand what the band represents. remarkably enlightened educational institute – Ireland’s first inter-denominational school – teachers support the founding of bands, even so far as giving them use of rehearsal rooms. Nonetheless, things moved slowly in the beginning. Still today, U2 willingly admit that The Edge is the only musician in the band. Adam is, measured by modern standards, just an average bassist and Larry is a workable yet primitive drummer. Bono would be an interesting singer, had the songs an interesting structure. “Had you heard us four years ago,” Bono says, “then you’d have really laughed. I was supposed to be the guitarist at the start, but because I couldn’t manage that, I became the singer. 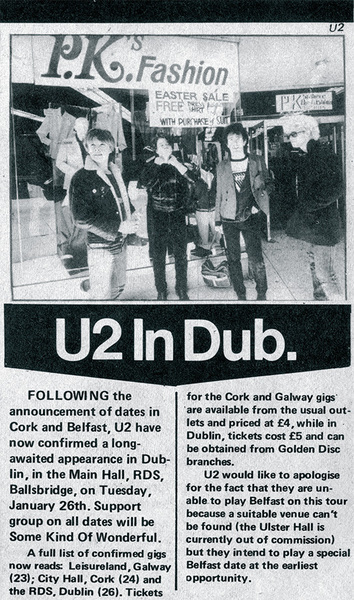 “In U2, we measure ourselves by our own unique standards,” he adds. “Our scale is what we expect of our music. We want nuances of feeling to come through. We want to broaden the medium and we want to use the colour palette of bass, guitar and drums to the maximum. We want to convey not just feelings of happiness, naturally; and not just feelings of anger, although they do play a part. But when I see a certain mentality in pop acts, The Exploited for example, who come along with such a violent attitude, it really gets me wound up. You know that it’s nothing more than a pose. It's amazing to see how clearly you guys saw the influence you wanted to have with your music, at such an early age. Kudos for sticking to it (and not letting snarky reporters get to you).